When Lucie Bowen was a child, an earthquake rocked her island home and took her father from her. Lucie and her mother moved to the mainland, leaving behind everyone they know. Twenty years later, she returns to reunite with her childhood best friend Katie and to satisfy her journalistic curiosity. Katie is now living on Marrow Island, which was abandoned after the earthquake triggered an explosion at the oil refinery. The Colony that inhabits the island now insists that the island is safe now and that they are bringing new life out of the tragedy that struck the island. Lucie is determined to track down the true story for her friend and for herself. 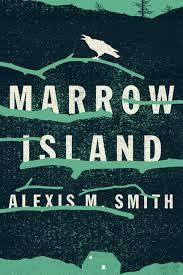 Alexis M. Smith shot to some literary fame with her lithe debut novel Glaciers. That story was simple and heartfelt. Reading Marrow Island is a very different experience and I am fascinated by this writer's ability to use such disparate writing styles well. Smith slowly and almost imperceptibly builds the tension with each turn of a page. This is not a book that is creepy in the traditional sense, but it will make the hair on the back of your neck stand up as Lucie wonders if she can trust old friends and new acquaintances or if the very nature around her will betray her. This is a thoughtful story about resilience and healing - about the ways we try to heal ourselves, each other, and the planet that we inadvertently and purposefully wound. This book could equally be called a thriller or a call for us to think about the ways that we are treating the world around us. Either way, it's one you should be reading. I've been meaning to read this since Kerry of Entomology of a Bookworm sent me her ARC, and yet it still languishes in a moving box somewhere. At least I know I'm in for a good time - I haven't seen a single bad or even so-so review of it! I loved how different this was from Glaciers, but I could still feel that it was the same author in a weird way. Definitely a great read! I always think it's interesting and impressive when an author manages to write two very different books, at least if I like them both :) I'm glad you enjoyed this one even though it was written so differently from the author's first book. It's Monday and I actually have a post! It's Monday and we're back to school! It's Monday. Happy Labor Day!